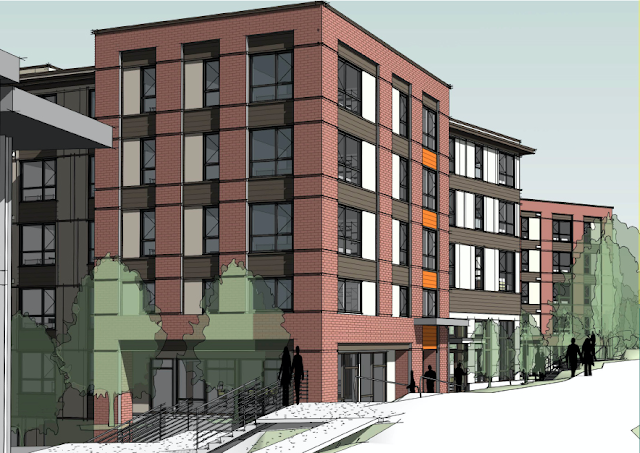 After several attempts by previous college administrations to create on-campus living at Shoreline Community College, it is finally going to happen. On Wednesday, May 30, 2018 from 12:30 to 1:30pm, the college will hold a groundbreaking ceremony for an on-campus residential building. The six-story building will be in the heart of the campus, near the student union building, the PUB. It will contain 68 units which will be a mixture of 4-bedroom, 2-bedroom, and studios for a total of 216 bedrooms. The units will share kitchens and bathrooms. All units are furnished and high speed internet is available throughout. Shared areas in the building will feature a lobby with lounge and study space. A Great Room can host meetings, conferences, and events. There will be on-site laundry facilities. An outdoor landscaped courtyard will have places to sit and study. Surface parking will be available. Construction is expected to be complete in time for Fall quarter 2019.